Imogen Heap is an artist extraordinaire, a singer-songwriter and composer who has trail-blazed the interplay of music visuals and technology. As well as receiving 3 Grammy's, her music also features on many film soundtracks. She is the curator of Reverb 2014 which takes place in August at the Roundhouse in London. David Mackenzie is a Scottish director and sometime writer whose films include 'Hallam Foe', 'Young Adam' and 'Spread'. His most recent film is this year's hit 'Starred Up' starring Jack O'Connell, Rupert Friend and Ben Mendelsohn, which premiered in Telluride & Toronto. Award-winning British actress Romola Garai has enjoyed a varied career in TV, film and theatre including 'The Hour', 'Atonement' and 'Junkhearts'. She has worked with directors such as Lone Scherfig, Joe Wright and François Ozon. She made her directorial debut in 2012 with the short film 'Scrubber' which showed internationally at film festivals including Sundance, Cannes and Edinburgh. Will is the Senior Programme Manager at British Council Film and has responsibility for short film promotion, the British Council Travel Grant Fund - run in partnership with the BFI – and the Shorts Support Scheme. Will has also been Head of Development on national short filmmaking initiative Collabor8te for its last two editions. Rodrigo Prieto is an Oscar nominated cinematographer. His film credits include 'Brokeback Mountain', 'The Wolf of Wall Street', 'Argo', 'Lust/Caution', 'Babel', '21 Grams', 'Broken Embraces' and 'Biutiful'. He has worked with directors such as Martin Scorsese, Alejandro González Iñárritu, Pedro Almodóvar and Ang Lee. He also made his directorial debut last year with short film 'Likeness' starring Elle Fanning. Danish writer-director Lone Scherfig began her career directing award-winning commercials and TV dramas. She has gone on to enjoy international success at festivals with her films including ‘Italian for Beginners’, ‘Wilbur Wants to Kill Himself’ and, BAFTA winning, ‘An Education’. Her most recent feature film is POSH based on the play and written by Laura Wade. Chris Moll, Head of Film at Creative England. He's responsible for the delivery of all their investment programmes including iFeatures and iShorts. Birmingham born actor David Harewood started his career in British telly before breaking into Hollywood. He’s best known for his role in hit drama Homeland and alongside Leonardo Dicaprio in Blood Diamond. Ben Roberts is the Director of the BFI Film Fund, the UK’s largest public film fund with a budget of £26 million. He oversees all the BFI’s Lottery investments in film development, production and distribution, and their international activities. Filmmaking trio Josh Mond, Antonio Campos and Sean Durkin make up Borderline Films, a production company which have brought Martha Marcy May Marlene, Simon Killer and Channel 4 mini-series, Southcliffe, to our screens. For the tenth anniversary of Warp Films, we invited head honcho Robin Gutch to give feedback on your work. Warp are an icon of British filmmaking, bringing Shane Meadows, Chris Morris, and Richard Ayoade to our screens. Kerry Fox has been a formidable face of the independent film community for 20 years. She's starred in indie classics like An Angel at My Table, Intimacy and Danny Boyle's breakout film Shallow Grave. Former journalist, Greengrass has brought a rigorous intelligence to his populist work, reaching audiences across the globe. A real supporter of independent film, the director helped set up Directors UK back in 2008. Arguably the worlds most famous photographer and co-founder of Dazed & Confused magazine and Dazed Film and TV Rankin has a long history with digital filmmaking. He's also directed some incredible music videos in recent years. Kim Longinotto, the director behind Divorce Iranian Style, Rough Aunties and Pink Saris is one of Britain’s most interesting filmmakers working today. Director of Touching the Void, One Day in September. Patron of the Documentary Network. Director of Slumdog Millionaire, Trainspotting, Shallow Grave, 28 Days Later, The Beach. Pictured talking at a Shooters event. As a rapper, singer-songwriter, actor, writer, and director there isn’t much this guy can’t do. In 2012, Plan B released Ill Manors, a film which he wrote and directed. He has also been a speaker at a TEDx event, where he spoke about “Youth, Music, and London.” With so much to say, we’re ecstatic that Plan B is an official patron for Shooting People. Ravi Amaratunga is an editor at Channel 4’s Random Acts and The Shooting Gallery. In addition, He’s part of the Creative Diversity department which works with new and emergent film companies. An important figure in the British film industry, Ravi is the perfect candidate to be a Shooting People official patron. Documentarian, director, humanitarian, and environmentalist Joe Berlinger seems to always be doing something worth noting. Joe is a two time Emmy and Peabody winner and an Academy Award nominee (Paradise Lost 3: Purgatory). This film heavyweight is a great addition to our official patron team! Widely regarded as one of Europe’s best documentary filmmakers, Nicolas Philibert is a force to be reckoned with. Not only is he a multi-winning director, but also he has been leading the way to bring feature documentaries to cinema audiences. Needless to say, we are honored to have Nicolas as an official patron. The funny and talented Sally Phillips is an actress, comedian, and screenwriter. Famous for her roles in Smack the Pony and the Bridget Jones movies, she is also a talented writer. Sally co-wrote The Decoy Bride, a feature film previewed at multiple film festivals and released in cinemas domestically and internationally. Director, critic, and host of the the former BBC series Scene by Scene, Mark Cousins knows his film. He has interviewed the likes of Martin Scorsese, David Lynch, and Roman Polanski. Mark’s series The Story of Film: An Odyssey has been screened countless times internationally. BAFTA nominee Clio Barnard (The Arbor) is not your typical filmmaker. Her work has been viewed in cinemas, international film festivals, and art galleries around the globe. Clio’s multidimensional works make her a true artist filmmaker. We are so excited to have her as a Shooting People patron! Academy Award winning filmmaker and former actress Andrea Arnold (Wasp), is a staple on the British cinema scene. Andrea’s adaptation of Wuthering Heights, which she directed and co-wrote the screenplay, has received high praise from critics all over the world. Long time Shooter and friend Briony Hanson was appointed new Director of the British Film Council in June 2011. Briony and her new team have already made key changes, opening up resources and support for filmmakers, and there's more to come. We're very pleased to welcome her on board as an official patron. Director, writer and artist Miranda July (Me, You and Everyone We Know, The Future) is one of the few creatives who manages to work outside the box but still garner attention from the masses. Her work is unique, funny and at time profound, and her artistic independence makes her a perfect patron for Shooting People. Matt Groening is a cartoonist, screenwriter and producer. He changed television forever when he created The Simpsons (the animated family first appeared as a series of short bumpers on The Tracey Ullman Show in 1987). He also went on to create Futurama. This man is a quite simply a legend. He’s the Pope of Trash, the Prince of the Puke, the Sultan of Sleaze – yes, we can only be talking about one man – John Waters. Having brought us such exquisite underground classics as Pink Flamingos, Female Trouble and Desperate Living, we are thrilled (and feeling dirty) to welcome Mr Waters to Shooting People. Sir, we salute you! Having stormed SXSW in 2010 with her debut feature Tiny Furniture, Lena has caught the eye of the US indie elite. She's currently filming her own HBO series Girls, which she wrote, directed and stars in. This lady is gonna be big! We love it dark and gritty, and Nick Cave offers just that through his fantastic film scores The Assassination of Jesse James, The Road and brilliant writing The Proposition. We are forever thankful to his great talent and fabulous moustache. One of the best actors working in the UK today, Paddy has given remarkable performances A Room for Romeo Brass, Dead Man’s Shoes, My Summer of Love and is a great figurehead for British cinema. He’s also directed his first feature Tyrranasorous, which was Sundance sensation. We can’t wait to see it. Berlin Audience Award winner (twice! ), Emmy Awards nominee and Sundance regular, Lucy Walker, is director of documentaries including Devil's Playground, Blindsight, Waste Land and Countdown to Zero. A triple Palme d'Or nominee, Michael Winterbottom is the director of features including 24 Hour Party People, 9 Songs, The Road to Guantanamo and The Killer Inside Me. American sculptor, filmmaker and performace artist Matthew Barney - of Cremaster film and Restraint drawings fame - is judging October's Film of the Month. Producer and Exec Producer of over 40 films including In the Company of Wolves and The Crying Game. Read shooters interview here on what it was like to direct his first film Stoned. Director of the Documentary Film Program at the Sundance Institute. We are delighted to have Cara as a patron of our Documentary Network. One of NYC’s top film players, Joana has produced excellent indie flicks such as Coffee and Cigarettes, Welcome to the Dollhouse and The Assisination of Richard Nixon. Director Adam Smith is the creator of punchy, quirky, slick visuals for the likes of The Streets, The Chemical Brothers and Jamie T. More recently he has directed 5 episodes of C4's Skins. Writer, Director and Shooter since 2004, Asif Kapadia won multiple awards for his debut feature, The Warrior. His film, Far North received its premiere at the Venice Film Festival 2007. The very embodiment of indie, producer Ted Hope has brought us ‘21 Grams’, ‘In The Bedroom’, ‘Happiness’, and the Sundance Grand Jury Prize winners ‘American Splendor’, ‘The Brothers McMullen’ and ‘What Happened Was...’. The list goes on.... Ted&apos;s blog is compulsory reading for indie filmmakers. Director of documentary Tina Goes Shopping, feature film Principles of Lust and film opera The Death of Klinghoffer. Tough, Funny, Smart, Producer of over 30 exceptional indie films and author of A Killer Life - How an independent producer survives deals and disasters in Hollywood and beyond. read the interview here. Film Artist, Choreographer, Performance Artist and Writer who Directed Orlando, The Tango Lesson, The Man Who Cried and Rage. Writer, producer, and director on some of film and TV’s most successful and controversial comedies, including Bruno, Borat, Seinfeld, Curb Your Enthusiasm, and Religulous. Composer of numerous films including The Cook the Thief His Wife & Her Lover, The Piano and Man on Wire. Nyman is also a conductor, bandleader, pianist, author, musicologist, photographer and film-maker. London-based director of the award-winning Onegin and Chromophobia, as well as numerous music videos. Belongs to 'that' British film dynasty. Writer of Collateral, Australia and story writer of Pirates of the Caribbean. Pictured with Shooters founder Cath Le Couteur. Read interview. New York based director of Supersize Me, Where in the world is Osama Bin Laden?. Also a very funny man. Read interview. 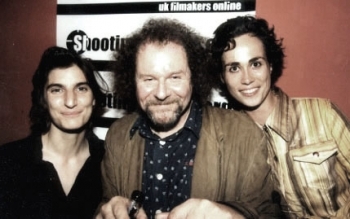 Founding patron of Shooting People, Mike Figgis, is best known for his films Leaving Las Vegas and Timecode. He also directed an episode of The Sopranos (cool!). Jason is Film Critic for The Observer, presenter of the Film Weekly podcast on Guardian.co.uk and Chairman of the London Film Critics' Circle. Director and Cinematographer of some of today's most innovative music videos, including A Skin, A Night, Miroir noir and All Tomorrow's Parties. It doesn't get much cooler than Vincent. Film Writer, author of Down and Dirty Pictures, Easy Rider Raging Bulls. One of our New York based patrons. Read interview. Actor, Writer and Director, pictured here after the Shooters interview on his Directorial Debut Wah-Wah with interviewer Mike Figgis. Writer/director of The Station Agent, The Visitor (academy nomination for Richard Jenkins) and actor (lots of things). Our first New York patron. Animator, director of Chicken Run, Wallace & Gromit, Creature Comforts. Patron of the Animation Network.